Broccoli, generic black olives and goat cheese. Do these things go together? Why, nurse yes they do. I’ve always found that fancy, oil-cured black olives lend a nice salty brininess to broccoli. Goat cheese and olive oil give this sauce a sumptuous creaminess to balance out the saltiness. I was tempted to call this a pesto, but I thought that wouldn’t go over too well with pesto purists. That said, the method is very similar. Steam the broccoli, then blend it with olive oil, black olives, goat cheese and a pinch of salt. What you get looks more like a dip than a sauce, but mixed with some pasta water, you get a velvety, creamy sauce flecked with bright green broccoli that’s a little tangy and really delicious. I tossed the sauce with whole wheat pasta and some browned Italian Sausage for a wholesome and filling lunch. Serve this with a big, green side salad and you’ve got a delicious weeknight meal. Just make sure your dishwasher’s empty — this bad boy makes loads of dishes. Thank God I’ve got a wonderful hub to take care of those pots and pans for me! Simply omit the sausage or add some baked tofu for a vegetarian dish or side dish. Set a large skillet with a lid over medium-high heat and add the water. Once it comes to a simmer, add the broccoli, cover and let steam for 2 – 3 minutes, until bright green and tender, but not mushy. Remove the broccoli into you food processor’s cup with a slotted spoon and discard the water. Use the same skillet to brown the sausage. While it browns, set a large pot of water to boil and make your pesto. When the water comes to a rapid boil, salt it generously and add your pasta. Add the olives, olive oil, garlic, goat cheese and salt to the food processor cup and pulse until smooth (about 30 seconds). If the sausage is browned and cooked through, remove from heat. When the pasta is almost al dente, reserve 1 cup of the pasta cooking water, then drain. Toss the pasta with the cooking water and broccoli/olive/goat cheese mixture until everything is well-coated and the broccoli mixture becomes a sauce. Stir in the sausage and serve with a sprinkling of freshly grated Parmesan cheese. Interesting take on pesto. :) Would it be safe to add in a pine nut or two to really edge it on that side? Sounds delish, and it’s actually an awesome new way to get people to eat their broccoli! It looks gorge. 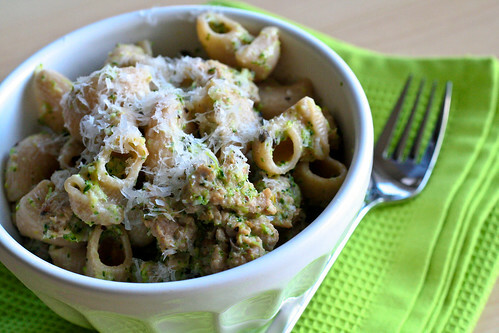 This really looks great and I will add toasted pine nuts to this one for sure!! Gah, everything always takes too many dishes (especially, when you don’t have a dishwasher, like me!) This does seem like a great weekday meal. I ran across your blog when I did a search for Fire Roasted Piquillo Peppers. I live in north Texas and we grill pretty much year round. Good luck with the grill. I love your recipes! I found your site researching pumpkin lasagna. I have yet to try that recipe, but I made this one last night and it was a HIT!! I have no leftovers. I love your recipes and can’t wait to see what is next! I’m using your recipes to help me be creative in my new dinner-for-dishes arrangement I have with my housemate. I go grocery shopping, he buys groceries, I cook dinner, he does dishes- it’s made us a much happier place! My husband and I have the same dinner-for-dishes arrangement. He loves to eat, I hate to wash dishes. Works out perfectly. As for the tofu, I’d dice it, then marinate it in olive oil, salt and pepper and bake it for like 30 – 40 minutes. Toss with the pasta and sauce at the end. Or, you can just pan-fry it since that will be faster. First of all- i just discovered your blog and i am in LOVE. i think i’ve bookmarked over 20 recipes to try! Also- i have a sensitive stomach and am only able to digest “hard” cheeses…would the flavors still be relatively the same if i were to use romano cheese instead of goat cheese? weblog, this webpage is actually amazing.